You demand quality, efficiency and value from your company and vendors. With The Super Option, you get that from healthcare too. 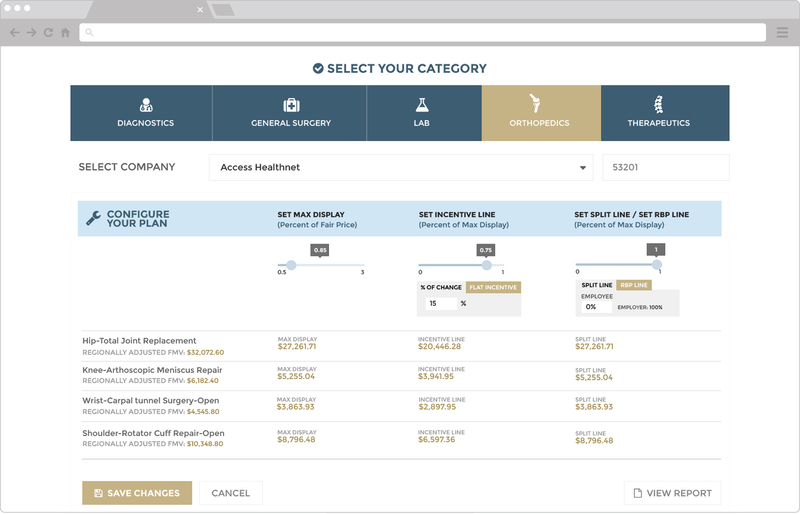 The Super Option is a free-market solution that gives you control of your healthcare spend by giving you and your team access to thousands of flat-rate bundled medical events via our proprietary, fully-customizable, cloud-based platform. Let us prove the savings to you. We work with employers to analyze their historical spend, and prove the opportunity The Super Option provides. Measurable results and timely reporting of key metrics are at the heart of how we help employers. Actionable information is delivered at every level through powerful dashboard reporting that you customize to your needs. Your organization is unique. A customized plan design, worksite education, advocacy and digital marketing tools are just a few of the engagement strategies we utilize to meet your needs and goals. The Super Option is fully customizable. Through plan design, employers can set parameters for procedure costs and provider distances and even incentivize employees for choosing cost-effective options. The Super Option is a marketplace where employees shop for healthcare services like they shop for everything else, making value-based decisions because price and quality information are available at their fingertips. Great employees are increasingly difficult to find and keep. Employers that utilize The Super Option have great news for their team: No or low cost healthcare is here. Care avoidance due to cost has become a real problem. Employees with The Super Option seek care earlier without the fear of an outrageous bill. Discover How the Super Option Can Impact Your Organization! Founded in 2014 by a team of dedicated healthcare and network specialists, Access HealthNet is a revolutionary solution that makes offering and administering a select panel of providers a simple turn-key process that can be customized to any plan.